July is a beautiful month on the homestead. 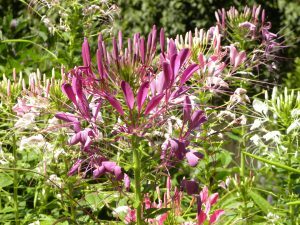 Flowers bloom, attracting butterflies, bees, hummingbirds and more. There is life and growth, and not much is dying back yet. Here at the end of this particular July, after a week of storms rolling through and with hot and humid conditions in the forecast, it’s already hard to remember that this month was drier and colder than it should have been. That made work easier, but ripening slower. At least the last week of storms did bring us enough rain to change our status from level 2 (moderate) to only a level 1 (abnormally dry) on the July 31st drought monitor edition. Most of this month brought us excellent working weather and we used it. consistently moist during the germination window, which can be 3 weeks. 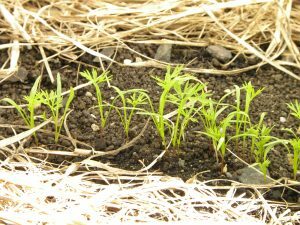 For my most recent seeding, the soil was, of course, warm by mid-July and I put up shade cloth to help with moisture retention – and had lots of baby carrots appearing in under a week! That is more like it. 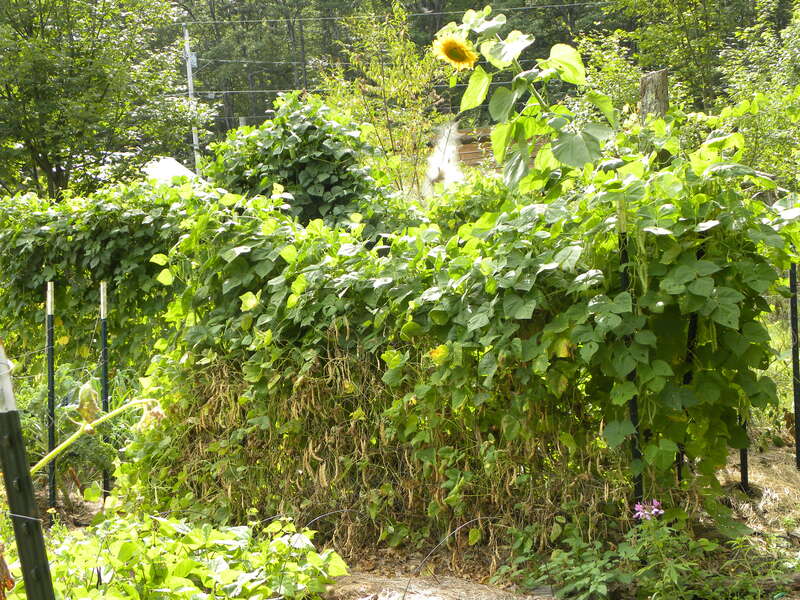 Other plantings included next rounds of bush beans, beets, and radishes. At the end of the month, I also started planting the fall crops of lettuce and spinach. 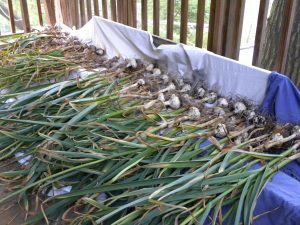 Throughout July I pulled garlic. The Russian Red was ready on July 14. I went ahead and pulled the Music the next day, and the New York Extra Hardy and Phillips around July 25. All varieties are beautiful and delicious, as always! They have been drying on our porch and are close to ready to trim and store. The beds I took them out of were replanted with soil building crops. 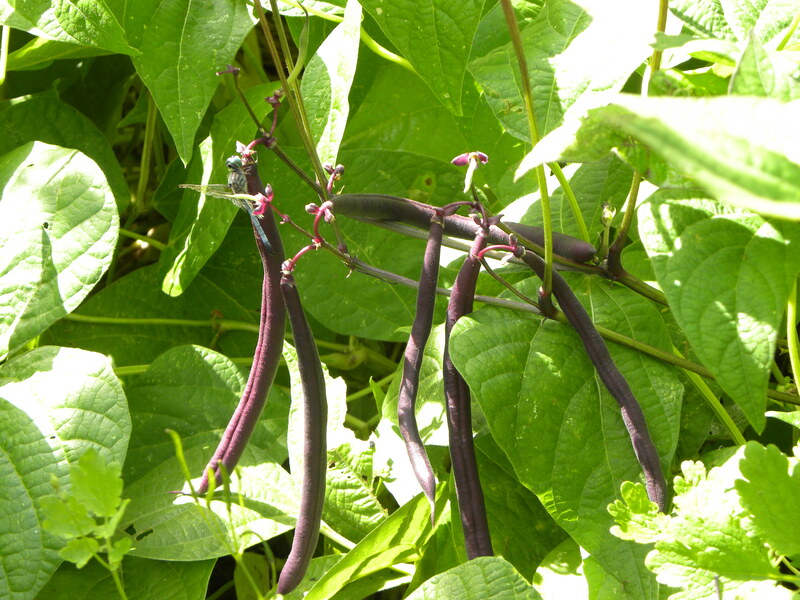 Usually that means a cover crop, and I have one that is growing Japanese Buckwheat, but the others I decided to try growing bush beans in. 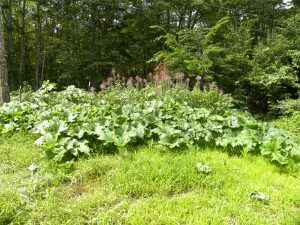 A nitrogen-fixing crop after garlic makes sense to me, and I’ll get a harvest out of it. Since I always leave the roots and crop residue anyway, I think it will accomplish the goal. 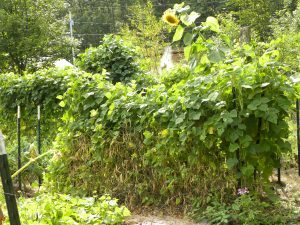 Other garden work included hilling potatoes, tying up beans and cukes for their vertical climbing, pruning off tomato suckers, adding mulch to beds and wood chips to paths. I am not having many disease or pest issues this year. Even if there were, I wouldn’t do very much other than observe and record what I saw. I have hand-picked a few cabbageworms off of my brassicas, which the chickens were happy to eat for me. find and free our beach plums the other day, and we noticed one vine has made it about 10 feet up a young oak! I’m letting that one go for it and look forward to seeing how high it gets. We continued to bring in organic materials to create more garden beds and to refresh some that were getting low. We came home with the usual: cardboard, seaweed, manure, coffee grounds and wood chips. Then I sowed cover crops to top them off. The goldfinches and chipmunks helped themselves to some of the seeds but didn’t get them all! All the spring babies are turning into adults. We have twice a day feeding, watering, and regular tending to their bedding. The young chickens need their tractors moved to new forage every couple of days. The ducks like some water for their bathing pleasure: Ducks Take A Bath – July 2018. 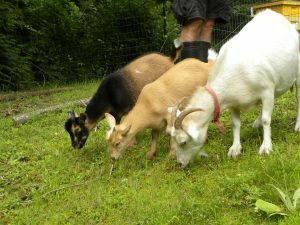 We bring the goats plants to eat and give them new pasture regularly. They also have their regular hoof trimming and socialization with us. 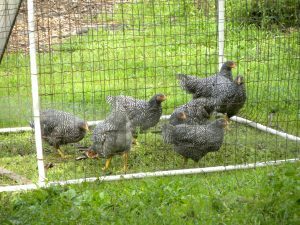 This time of year, rain water and abundant food choices are reflected in their shiny coats and full tails. All of the blood testing came back like we’d hoped – no diseases or deficiencies found. We have also taken time on really hot days to do some outbuilding organizing. Our jam-packed, impossible-to-use potting shed is now a well-organized tool shed and the hay trailer is clean and ready for the arrival of 150 bales of organic second cut hay the moment we can get it. I believe it was Scott Nearing who talked about how critical it was to maintain your space on a farm for ease of use and longevity of equipment. (If anyone knows this passage or if someone else said it, please share!) Every minute I am searching or digging around for some item is not time well spent and we just don’t have that to waste. I inspected the hives a few times in July. First, I had to assess them. I made the decision to requeen both. This required hive visits to prepare for her arrival, then to ascertain that she was accepted. Both hives did allow the new queens to get established, which means that these hives will go into the winter with young, northern-bred Russian queens, which gives them a good chance at living through this winter. 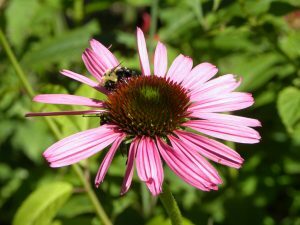 And now that the drought has lessened, maybe we’ll have a strong fall nectar flow from which they can put up lots of nutritious honey. Food preservation has begun! So far I’ve been freezing berries and dehydrating summer squash and kale. Much more to come. Since our blueberry bushes are still young so giving little fruit, we have been picking at Tuckaway Farm. I am thrilled to have this access to organic fruit. Some of my early jobs at farms included a lot of berry picking and I still love doing it. 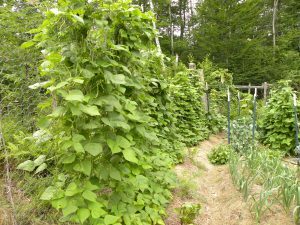 pounds of peas, 65 garlic tops, 4 pounds of a mix of kales and collards, 1 pound of cauliflower, 2 pounds of broccoli, 30 pounds of summer squash, 10 ¾ pounds of beans, 1 ½ pounds of basil, 1 radish, 12 pounds of red and white currants and quite a few hand-fulls of various herbs. I also began gathering fallen apples from some area trees for the goats, a total of 20 pounds so far. We collected 224 chicken eggs, 87 duck eggs, and 11 gallons of milk. What we are still eating from previous years: honey, canned peaches, blueberries and strawberry jelly, dried kale and beans, frozen eggplant, pesto, and salsa. We made 678 kwh from the PV solar panels – a very good month. That’s the upside of all those sunny, dry days! August should be full of food preservation: drying, canning, freezing. 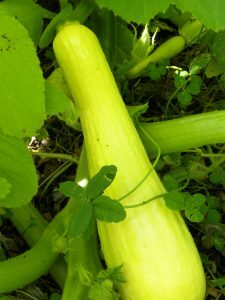 It looks like I’ll start curing winter squash for storage very soon as well. There will be plenty of upkeep to do. We will enjoy the bright, bountiful summer, but it’s time to be planning for winter as the days grow noticeably shorter. The cycle continues!